When Phillip and Joy Black were in high school together, we wonder if they dreamed they’d own one of the coolest hangout spots in Killington. 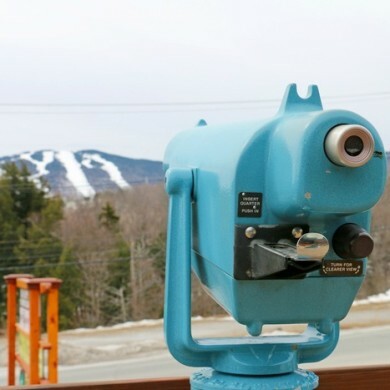 After working for 10 years in the service industry and getting to know the ski town clientele, the couple opened the Lookout Tavern in 2000, at the former site of Killington’s oldest ski lodge. The tavern’s name is an homage to the view, and the lookout from the restaurant and bar’s seasonal deck – where you can perch during the three warmer seasons (that’s spring, summer and fall) for views of the town and the valley. The Blacks keep the Lookout open year-round, because company values are more important to them than just making money. They like to travel, but they always bring something back to their hometown restaurant – serving up a menu of Tex Mex and Classic American fare. The food is good (and reasonable) and the atmosphere is fun, from the peanut shells that blanket the floor like a new-fallen snow to the beer huggies, race bibs and license plates hanging from the walls and ceiling. Although they sell a lot of their 100% Angus beef burgers, the burrito is what Phil says he’d order. The chances are high you’ll strike up a conversation with someone new while standing at the U-shaped bar – especially during Happy Hour from 3 to 6 p.m., when buffalo wings are half off. Shoot pool in the game room, or gather around large flat-screen TVs when your favorite team is playing. The Lookout has eight beer lines, because offering fewer beers means they can keep the kegs fresher. They’re mostly Vermont craft beers. Something stiffer? Try the handcrafted Goodbay Smash, a rummy, fruity, potent cocktail. Call ahead to reserve your seat, or for take-out and delivery. You can also book passage to and fro on the Lookout’s courtesy shuttle. Owners Phil and Joy make every attempt to know their customers by name, so be sure to introduce yourself. A favorite among locals from the ski instructors to the lifties, the Lookout is splendidly divey … and good for a good time. The Lookout Tavern is located at 2910 Killington Road in Killington, VT. For more information, please visit the Lookout website or call (802) 422-5665.